My great grandparents Sumner Dunham (1871-1947) and Cora Belle Ivans (1873-1963) were married on 8 July 1894 in Cummings, Mendocino County, California, with Cora Belle’s parents William and Mary (Wilson) Ivans serving as official witnesses. It’s unlikely Cora Belle’s brother John E. Ivans, my great granduncle, would have been in attendance at the wedding. Then about 18, he may have been serving a sentence for arson. John was born about 1876 in California to William Ivans and Mary P. Wilson. Although born in Tennessee in 1842, William had moved to Missouri and served the Union in the Civil War. He was disabled due to an eye injury. While in Missouri he had married Mary P. Wilson on 8 June 1862 in Douglas County. Mary, had also been born in Tennessee, on 6 December 1837. William would die on 15 May 1908 in Santa Rosa; Mary on 5 April 1918 in San Francisco. 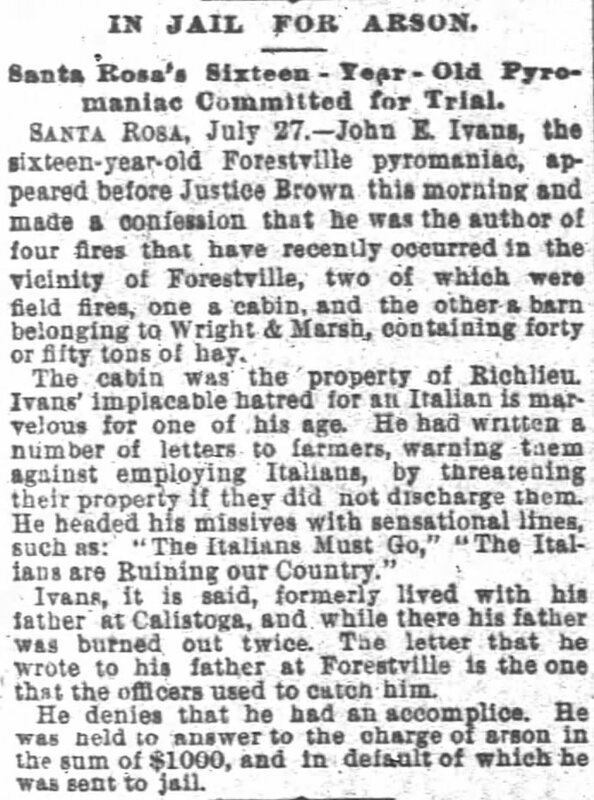 In July 1892 John was accused of burning down four buildings in Santa Rosa, at least one fire being occasioned by a strange hatred of Italians, according to the San Francisco Chronicle on 28 July 1892. He was 16 years old. Sadly, it appears this teenage strangeness and lashing out was not the only problem John would have in his life. 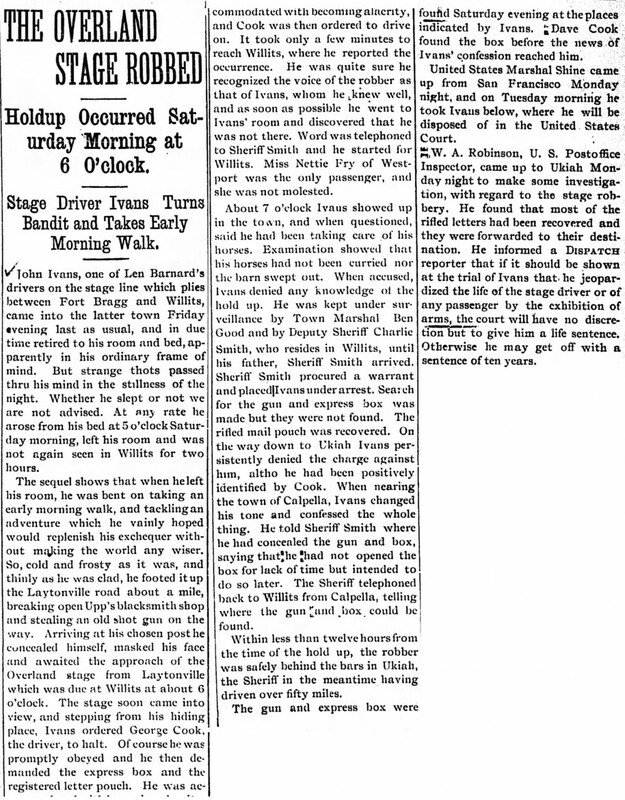 In December 1901, then employed as a stage coach driver with the Overland Stage connecting Fort Bragg to Willits in Mendocino County, John inexplicably thought he could somehow get away with robbing his own employer. According to the Ukiah Daily Journal of 27 December 1901, after his own shift had brought him to Willits, John robbed the stage coach approaching Willits from Laytonville. Although he wore a sack over his head, the driver, George Cook, John’s coworker, immediately recognized his voice. The sheriff was promptly summoned from Ukiah, who then arrested John. John confessed to everything before they even arrived at the jail in Ukiah. There was some suspicion as to John’s mental state. In an account from the Ukiah Daily Dispatch of 3 January 1902, a report is cited from the San Francisco Chronicle describing John attempting to beat his head on the floor of the jail, screaming. He spent the night in a straightjacket in a hospital mental ward. 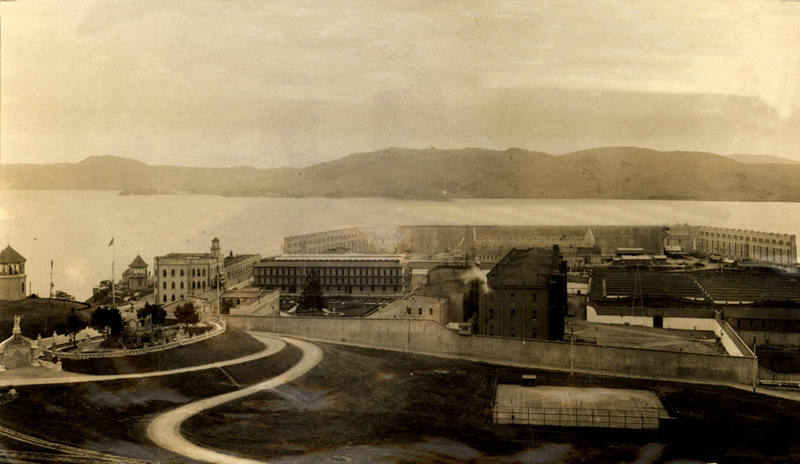 John was quickly found guilty and sentenced to a six-year term at San Quentin, where he was received 22 January 1902 at the age of 22. By way of comparison to show how draconian our California sentencing guidelines have become, today his sentence would be almost 20 years. He was released after serving four years of his term, 19 March 1906. Comparing his admission photograph to that taken at his discharge, one can clearly see the toll stress had taken on him. In 1907 John was living in Eureka, working as a teamster. After that I have found no record of him until his death on 23 May 1935 in Sonoma. He is buried in a potter’s field on Chanate Road in Santa Rosa. Just wanted to say what a wonderful story to read! Having lived in that area made it especially interesting, and now that I have an interest in my own genealogy, I am massively impressed that you were able to find those newspaper articles! A very interesting post. I am the great-granddaughter of George Cook.